A Year of FHE: No time for personal study each day? THIS is your answer: Deseret Book's Bookshelf Plus! No time for personal study each day? THIS is your answer: Deseret Book's Bookshelf Plus! When I was a missionary I promised myself that, for the rest of my life, I would have 1 hour of personal study every day. I was convinced that there was no excuse not to, no matter how busy life gets or how many kids you have. I am chuckling a bit just typing this. Poor, naive, Emilie. So how does a frazzled, tired, over-scheduled, Mormon mom get some personal study in without rising at the crack of dawn? I found the perfect solution for me and I hope it will resonate with you as well. I love reading, but I never buy "real books" anymore. I can't make room in my home for more books and I want to have all the books I want to read in an instant right at my fingertips for when the Kindergarten pick-up gets delayed. 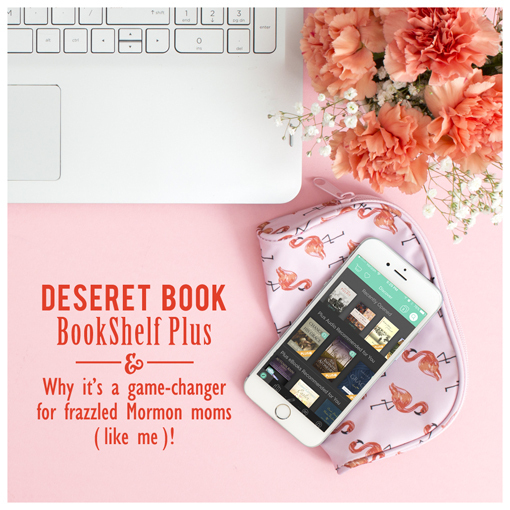 So I was so excited to learn that Deseret Book has a new subscription service called Bookshelf Plus. It offers access to its entire audio book and talk library as well as more than 1,500 ebooks for a monthly fee via its Deseret Bookshelf smartphone app. Deseret Bookshelf is available on Android and iOS devices and is FREE to download (FREE is my very favorite price). Products are available for single purchase in addition to the free content featured in the app (including the Latter-day Saint scriptures, lesson manuals, general conference addresses, and more in print and audio formats). I looked up ALL of my favorite LDS books and I found every single one of them! They even had Contemplations of a Convert (read my full review here), which I adore, and is not out of print! The entire ebook library is searchable and taggable. Users can also highlight and share favorite quotes on social media as image memes from inside the app. Let me just say that again: if you want to easily share your faith online and make beautiful quotes to share on Facebook, Instagram, etc. you can do it easily from right within the app! What a great way to share the gospel with others! All of the quote images in this article were made using 2 clicks within the app! I love that I can read while waiting in the car for my prescription refill, listen while I do the dishes, take notes and share the gospel all from one app! Deseret Book Platinum members can access the Bookshelf Plus membership for $6.99 per month or $69 annually. Customers without a platinum membership gain access for $9.99 per month or $99 annually. Click below for a FREE trail! See if it helps you be nourished by the Spirit and by good words each day the way it helped me. Let me know how you like it and if it helps you find more time to feast upon the words of Christ! I am totally going to get this. I've loved my audible subscription but I'm so happy to learn that there is an LDS book option!!!! Thank you Emilie!